Abies yuanbaoshanensis, first described in 1980 by Lu Yong-Jun and Fu Li-Kuo, is commonly known as Yuanbaoshan fir or as 元宝山冷杉 (Yuanbaoshan lengshan) in the Chinese language. It seems to be most closely related to A. forrestii and is placed in section Pseudopicea, subsect. Delavayianae. Description. Yuanbaoshan fir is an evergreen coniferous species of tree which will grow to mature heights of 80 feet (25 m) tall with a trunk up to 24 inches (60 cm ) in diameter at breast height. Bark dark red-brown and irregularly fissured. Branchlets are initially yellow- or light brown, turning brownish black in 2nd or 3rd year; they are glabrous in texture. Winter buds are brown-red, conical and very resinous. Leaves are slightly or rarely radially spreading and shorter on upper side of branchlets, laterally spreading and longer on lower sides, linear, 0.4 to 1.1 inches (1 - 2.7 cm) and 0.07 to 0.1 inch (1.8 - 2.5 mm) wide with stomatal lines in 2 white bands abaxially. Seed cones are green or yellow-green, ripening light brown-yellow, shortly cylindric in shape, 3.2 to 3.6 inches (8 - 9 cm) long and 1.8 to 2 inches (4.5 - 5 cm) broad. Seed scales at middle of cones are flabellate-trapeziform in shape, ca. 0.8 by 0.9 inch (2 × 2.2 cm) its exposed parts are densely pale pubescent, with recurved margins. Seeds are obtriangular-ellipsoid in shape, vesicular, dark red-brown and resinous, ca. 0.4 inch (1 cm) long, including the cuneate wing. Pollination takes place in May, with seed maturing in October. Distribution. The species is native to China — northern Guangxi province. 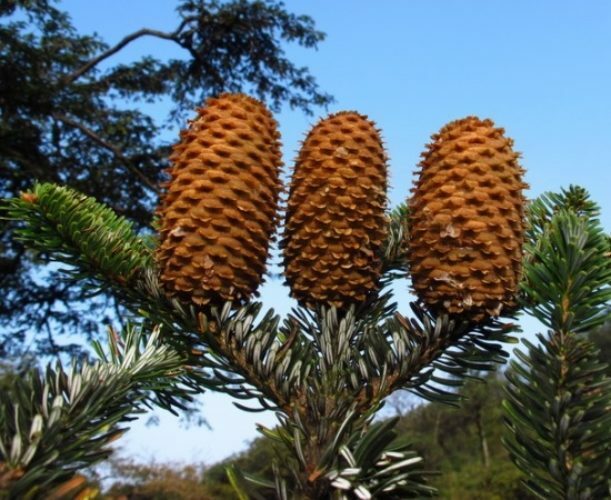 This is a relatively recently discovered species confined to Yuanbao Shan in Rongshui Xian county which is outside the general range of Abies species. The whole population is within an area of 10 acres (4 hectares). The population is estimated to number 589 plants and the population structure is skewed to old (senescent) individuals and young ones, with very few middle-aged plants. The highest mountains in Guangxi, like Yuanbao Shan, have a very cool, wet climate, with annual precipitation exceeding 80 inches (2,000 mm). The summers are cool and cloudy, the winters last four to five months and bring abundant snow from December through March. This species occurs in mixed deciduous-coniferous forest with other conifers (e.g., Tsuga chinensis) and broad-leaved trees. Abies yuanbaoshanensis — mature seed cones and foliage. 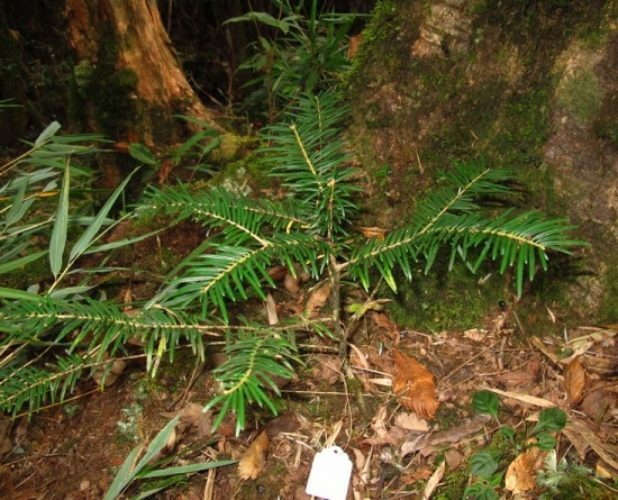 Abies yuanbaoshanensis — a sapling growing in the wild.